Yes, it is very maneuverable. S1 waterbike is designed to have a sharp and silent maneuverability. This is achieved by the design of the boat with the pedal power system which contains the rudder and propeller placed in front side. You get less movements for an accurate positioning. Is the S1 waterbike fast? Yes. The S1 waterbike can be fast, but it is designed for best performance in time of fishing, when silence and low generation of waves is the most important. If you are riding softly, you will go several miles per hour. Put a bit of muscle into it and you can go quite quickly. Yes, it is stable. S1 waterbike is more stable than a kayak. This is achieved by the design of the floats and by the distance between them. Can children use S1 waterbike? Yes. Of course, children should use S1 waterbike with supervision and life preservers. Most 12 year olds can use S1 waterbike. Please provide constant supervision. The S1 waterbike is safe, but the environment it works in can be dangerous. Is S1 waterbike easy to carry? Yes. S1 waterbike weighs 25 kg, it has carrying rack support for floats, the other elements can be easily carried by hand. The S1 waterbike floats weighs less than 18 kg and they can be transported by hand easily. S1 waterbike can also be easily transported into the car boot and on top of your car. Can S1 waterbike be used in waves? Yes. We have tested it in 1/2 meter waves and it performed very well. A 45 degrees approach give you the maximum stability. Do not ride waves onto the shore. Get off before any wave that breaks on the shore. Also, Please be cautious in rougher water and use a life preserver in rougher conditions..
How does S1 waterbike perform in windy weather? Very well. S1 waterbike works well in strong winds. The floats design deep emerged into the water give a excellent stability so the wind canâ€™t turn and move you on as they like. But please be extra cautious in these windy conditions. Often is best to bike against the wind in windy weather so that you can be sure you can handle the existing wind conditions. If you are taking S1 waterbike into strong wind conditions, and you are new to the area, please ask somebody from the area about the waters. There might be currents as well as the wind. When you combine these forces, things can become a problem. Please use a life preserver in windy weather. Yes. It is comfortable. If you find the plastic of the seat to hard to seat on, you can add a thin seat pillow. S1 waterbike has both a seat and a backrest to provide extra riding comfort. You can ride comfortably for hours on the S1 waterbike, itâ€™s like sitting in a office chair. How good is the steering on the S1 waterbike? Excellent. S1 waterbike turns on the spot. First you have a handsfree steering. Swiveling the chair gives you 90 degrees turn of the rudder in each direction, this added with pedaling forward and backward gives you a 360 degrees control. The floats, rudder and handsfree steering were designed for very fast turning. Please see the maneuverability video. Does S1 waterbike go backwards? Yes. S1 waterbike goes front and back easily and quickly. Going backward can be useful when you get close to shore and when you want to turn around. Also, fishermen find it quite useful in getting close to those special spots. Is it easy to get on the S1 waterbike from the water? Yes. Hold onto to the pedal power unit and pull it from the water to the shore. Or get on the S1waterbike from the side. If the S1 waterbike were to be upside down in the water, is it easy to right up? Yes. You have to turn it up from the pedal power unit. Do not try from the side, it will be more difficult. How shallow water can I travel with my S1 waterbike? S1 waterbike need 70 cm minimum depth of water. 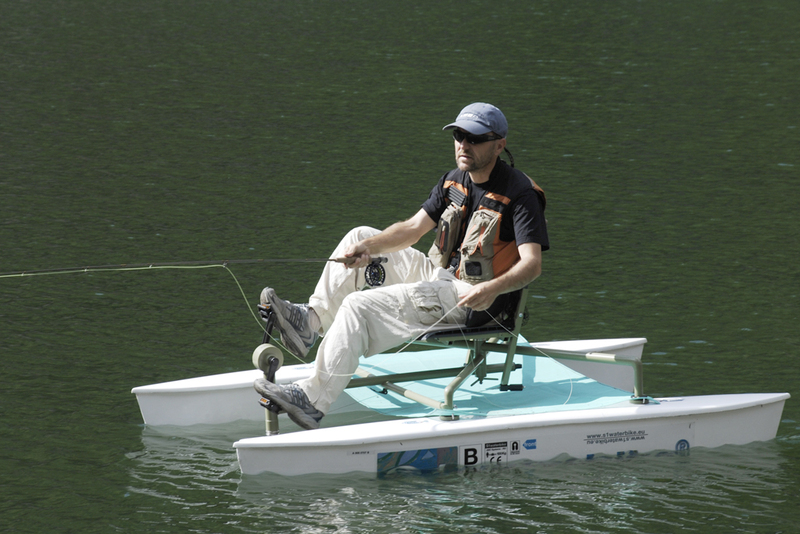 For less depth of water the pedal power unit can be folded between floats and a light scull is needed. Can 2 people use the S1 waterbike at once? No. The S1 waterbike is designed for 1 person. The S1 waterbike is designed to give each rider a very personal ride and a personal feel for the water. If you need to stay together with someone who rides also a S1 waterbike you can connect the bikes together for a break. Can the S1 waterbike seat be adjusted? No. At this first basic model this is not possible. We work on a second model where we want to adjust the distance to the pedals also. Is S1 waterbike good exercise? Yes. It is great aerobic and anaerobic exercise even if it is not its main purpose. You can compare S1 waterbike use to bicycle riding and spinning. The pedaling is great aerobic exercise. Also, the legs and stomach get a workout too. The faster you push on the pedals, the higher the workout. What range of accessories S1 waterbike has? For the moment we produce the basic boat, but we have in development a range os accessories that will improve your fishing: a chair back rest bag, a bag over the floats, an inflatable kit for overweight, a camera arm for filming, a rod holder. Also we develop a model with inflatable floats, that soon will be available on the market. Can I put S1 waterbike on my car? Yes. You can fix the 5 components onto the car carrying rack, but we recommend to fix only the floats, the rest will fit easily into the car boot. Will S1 waterbike fit in sailboats and yachts? Absolutely. It take a small space to storage, only the floats need 2.2 x 0.6 meters. How can I store the S1 waterbike at home? You can hang the floats on the garage walls or in a storage place using the floats carrying support, and the rest can feet easily in a small space. What do I do about spare parts? Contact by email the producers commercial manager at leonard.bica@siwaterbike.eu, give him the serial number of the S1 waterbike you own, and tell him the part you need. He will do the rest. What maintenance is needed for the S1 waterbike? Please see the maintenance part of this site. Does S1 waterbike have a warranty? Yes For consumers, the warranty is for 2 years. For rental operators, please contact the technical manager. Is there a place on S1 waterbike to hook my life preserver? Yes. On the chair backrest. What is the maximum weight allowed? The safety allowance is 100 kg for this model. However, we recommend that users are less than 90 kg. Do I need a boat license to use the S1 waterbike? Can a motor be put on the S1 waterbike? No.If somebody use the S1 waterbike with a motor even a electric one, then the warranty will automatically become invalid. Can the S1 waterbike be used behind a motorboat? No. If somebody tries the S1 waterbike behind a motorboat, then the warranty will automatically become invalid. The S1 waterbike can be pulled by a motor boat without passenger and only with the pedal power unit folded between floats, so the rudder and propeller should be off the water. Should I ride S1 waterbike at high speeds onto the shore? No. The S1 waterbike is fast. If you come into shore too quickly, with waves behind you, and the rudder grounds on the bottom first, as it will, you could be thrown forward over the bike. Also, you could damage the rudder and floats on the rock. Also, S1 waterbike has a rudder and propeller mechanism that could get damaged. S1 waterbike is a fishing performance bike, and please treat it with a professional courtesy. It does things no other product can do. Can use my own propellers on the S1 waterbike? No. The S1 waterbike propeller was especially designed for the S1 waterbike. It is, we think, the optimum design and other designs might hurt the performance or safety of the S1 waterbike. Please donâ€™t change the propeller. If you have a design that you think will work better, please contact us directly at design department. Please donâ€™t put a different propeller on the S1 waterbike as this will invalidate the S1 waterbike warranty. Where can I buy S1 waterbike? S1 waterbike is establishing a global authorized dealer network. Please see the pricing part of this site. Our authorized dealers are chosen on their ability to both sell our product and also to service customers. This means that S1 waterbike dealers are trained on S1 waterbike features, product usage, safety issues, and fishing benefits. S1 waterbike offers you a Total Product Experience. To us, this starts at the design stage and it never ends. Every e-mail you send to our dealers or to us must be taken care of. Every inch of our product must perform well, and get better year after year. Please do not buy an S1waterbike from an unauthorized dealer. This will invalidate the S1 waterbike warranty. What kind of bike frame is used on the S1 waterbike? S1 waterbike incorporates a lightweight, all aluminum bike frame that was custom designed for application on the water. The S1 waterbike frame is very sturdy. In the S1 waterbike photos, you can observe very solid support structures that provide a safe, solid and comfortable ride. Does S1 waterbike come in different colors? No. The basic product is light green gray frame with white floats. We shall develop a range of colors in future. However, if you are a corporate account and plan to purchase in volumes, we can make special colors for you. What is the technology used in the S1 waterbike floats construction? S1waterbike floats has worked with a Fiberglass Company. S1 waterbike uses conventional glass weave filled with polystyrene foam. How did you get the name S1 waterbike? One friend of the designer the sculptor Ovidiu Vuia said seeing the first prototype that this is the super fishing boat in a funny way – in Romanian: Superpescuitor – a super tool that fish. So many days after that we called so. Than because it was the first boat like this we add the number 1. Later we decide to keep the S from superpescuitor and 1 from the first boat, so the S1waterbike name was born.